An optional rule is that, when building in this manner, players may combine other cards on the table, and build in the first manner. For example, suppose the cards on the table are 2 K 6 5 8, and the player holds a 3 and an 8. Thet may play their 3 onto the 5 to "build eight" and in the same move "build eights" by gathering the 5-3, the 8, and the 6-2 together onto one pile, taking in all five cards on their next play. Laying: Any card may be discarded face up to the table. Pairing: Any card may be used to take another card of the same rank, or a build with the same value (to understand what a build is, please continue reading). Combining: A number card may be used to take two or more cards whose rank total the number on the card being used to take them. For example, a player may take a 2 and a 5 with a 7, or may take a 2, 4, and 4 with a 10. Building: Cards may be placed upon one another to represent a new value on the table. The procedure for this method is listed below. Face cards do not have a denomination and are not available for combining or building, though multiple face cards can be paired simultaneously. For example, if a player has a queen in their hand and two queens lie on the table, that player can acquire all three queens. A player may lay one card on top of another if their total equals the total of a card in his hand and announce that the two cards are built to the total. Builds of this type may be taken in by either player by pairing. The building player's adversaries may also take in a build by combination; for example, an eight build may be combined with an ace if an adversary holds a nine. Any player may also continue to build on a build, for example, a seven build could be built to nine by a player with a 2 and an 9. The player who originally builds may also re-build, but only if he holds all appropriate cards: in the example above, he would have to hold both a 7 and a 9 to make the required building steps. In the second type of building, a player may lay one card on top of multiple cards to build to one numerical value. For example, if a player holds a 3 if their hand and a 2 and 4 are on the table, that player may place the 3 on the 4 and the 2 and declare "building 9." The players cannot lay one card on top of another in an effort to claim those two cards built together if their values are the same. Thus there are 11 points to be won in each round. 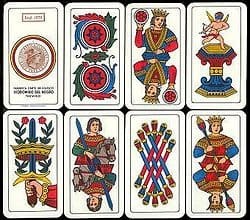 If "most cards" or "most spades" are held by two or more players, no points are awarded in those respective categories. The number of rounds played is determined by the number of players present. Each player must deal twice in a complete match, so if there are 3 players, then there are 6 rounds of play. At the end of the 6 rounds, the player with the most points is the winner.